"Serving the Community With Pride Since 1925"
A Corn Hole Tournament will be held at the fire station on Saturday May 4, 2019 starting at Noon. In conjunction with the event the fire company will be selling refreshments starting at 11:30 A.M and running into the afternoon. Questions on the Corn Hole tournament are to be directed to Shaun Baird. Annual Easter Egg Hunt will be held on Sunday April 14, 2019 at 2:00 P.M. at the fire station located at 516 Market Street in Bolivar. Next Sub & Pizza Sale will be on Saturday April 20, 2019 at 9:00 P.M.
Family Fun Night will be held on Saturday April 27, 2019. Doors open at 6:30 P.M. with drawings starting at 7:00 P.M. Tickets are available from any member or by calling 724 - 676 - 4714. Tickets are only $5.00 which includes your admission, food and beverages and 5 numbers for chances on 7 different cash drawings through out the evening. Carnival style games and tear open tickets will be available. A children's game area will be available. Bolivar Area Community Yard Sales will be held on Saturday June 22, 2019. These sales are always held on the "Third Full Weekend" in June of each year. Table space will be available in the fire station for only $5.00 per 8 foot table. Refreshments will also be sold at the fire station. More information will be available by the end of April. Any questions can be directed to John and Heidi Speidel at 724 - 676 - 4714. Thank you to all that attended and supported our 2019 Cash Bash. Your support helped to make this event a huge success. The 2020 Cash Bash will be Saturday March 7, 2020. Tickets will be available in December of 2019. 2019 Bolivar Firemen's Carnival will be held on July 10, 11, 12 and 13. Contact John Speidel at 724 - 676 - 4714 for information on this event. The 2019 Tri - Community Halloween Parade will be held on Sunday October 27, 2019 at 2:00 P.M. The 2019 basket party will be held on Sunday November 10, 2019 at the fire station. Doors open at 1:30 P.M. with basket drawings starting at 3:00 P.M. To donate a basket or door prize, please contact Heidi Speidel at 724 - 676 - 4714. The 2019 "Fall Crawl" 5K race will be held on Saturday November 9, 2019 at 9:00 A.M. The 2019 3 Month Calendar Ticket will be available starting in July of 2019. Thank you to all that purchased the 2018 Calendar Ticket. All 500 tickets were sold for 2019. Best Pumper over 1500 G.P.M. "Best FREE Fireworks display in the area"
We Rent Tables and Chairs!!! Please feel free to contact Gary Baird at 724 - 388 - 2853 with any rental questions. Looking to hold an event (Wedding, Shower, Family Reunion, Birthday Party, Anniversary Party, etc.) in 2019. Our social area is now air - conditioned. Please feel free to contact Gary Baird at 724 - 388 - 2853 with any rental questions. 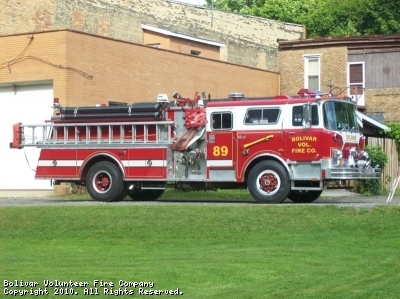 The Bolivar Volunteer Fire Company is always looking for individuals that would like to serve the community. We offer different types of memberships for any individual that is 14 years of age and older. With the different types of memberships, you get to choose if you want to respond on emergency calls or if you would just like to assist with the fundraising duties of the organization. 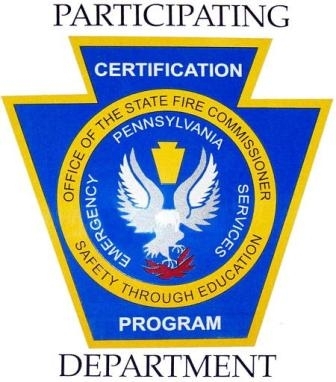 If you would like to gather more information, feel free to either stop in that fire station on any Monday evening after 6:30 P.M. or contact John Speidel at 724 - 676 - 4714. Thanks to the Community Foundation for the Alleghenies for the grant to support heating and cooling our facilities. This is the official website of the Bolivar Vol. 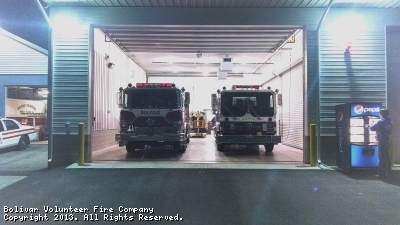 Fire Company "Station 89" we hope that you will enjoy our website. ***Thank you to all that supported our Annual Car Wash and Refreshment Sale that was held on Saturday May 12, 2018 from 9:00 A.M. to Noon. ***The 2019 Turkey and Ham Raffle will be held on Saturday November 23, 2019. ***We also have $2.00 tickets that go off every month, if you are interested in purchasing one of these tickets please contact the Bolivar Fire Hall at 724-676-4720 or Lee at 724-549-3494. The Bolivar Volunteer Fire Company does not solicit contributions by telephone, nor is it affiliated with any group or agency that does. 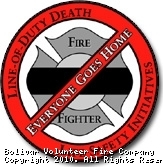 Any donation to any organization who solicits donations for firefighters by telephone does not benefit Bolivar Volunteer Fire Company in any way. 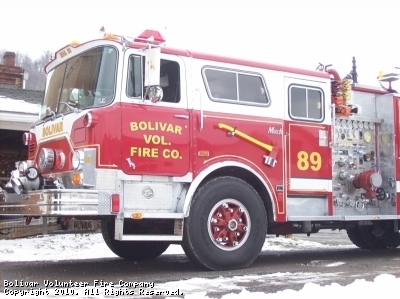 Bolivar Volunteer Fire Company is a 501(c)(3) non-profit organization, and all donations are tax-deductible. 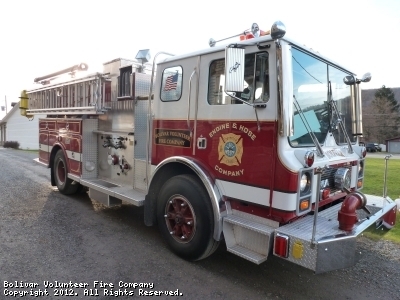 What is your favorite type of opperation at a fire scene? This site has been viewed 188,221 times.